The Pioneer 4 - 4 wheel scooter offers superior maneuverability and performance with many extra features! The Pioneer 4 is the scooter of choice for outdoor use over grass and gravel. 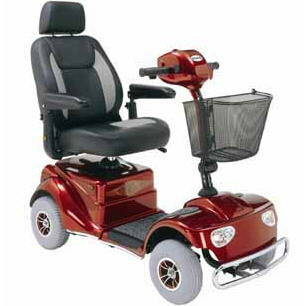 Standard features include swivel seat, full light kit including head light, tail lights and directional signals, front and rear safety bumper and rear anti-tip wheels, ABS body and padded adjustable flip-up arms. The large two-toned contoured captains chair with head rest comes standard with angle adjustable seat back. Angle adjustable tiller and front basket are standard. Adjustable seat height and positioning. Head light, tail lights and turn signals. Weight w/ batteries 232 lbs. High back contoured captains seat with headrest.